Conductivity meter electrodes normally become coated with impurities. The degree to which this occurs will depend upon the nature of the samples being tested. It will also depend upon whether or not the electrode is rinsed with distilled water and properly stored after each use (Fig 11.4 & 11.5). Electrode contamination causes a decrease in the effective surface area of the electrode exposed to the solution. This will lead to lower values being recorded, unless frequent calibration is performed. When correct practices are followed, quality conductivity equipment needs calibrating only a few times per year. An indicator of the need to clean is given by the extent to which the meter drifts out of calibration. 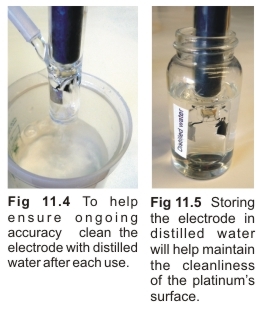 Store the electrode in distilled water when it is not in use (Fig 11.5). If contaminants are not removed by the rinsing process, they will tend to encrust on the electrode’s surface if left to dry out.